DAFNIYA/AL-QAWALISH, Libya, July 9, 2011 (Reuters) Rebel fighters braced for further attacks on Saturday from forces loyal to Muammar Gaddafi after the Libyan leader staged a show of support at home and threatened to strike his enemies abroad. Rebel fighters braced for further attacks on Saturday from forces loyal to Muammar Gaddafi after the Libyan leader staged a show of support at home and threatened to strike his enemies abroad. Rebels in Misrata said the death toll in the western town, a longtime insurgent stronghold, had risen to seven from six, with at least 17 wounded, after a heavy attack by Gaddafi artillery the day before. 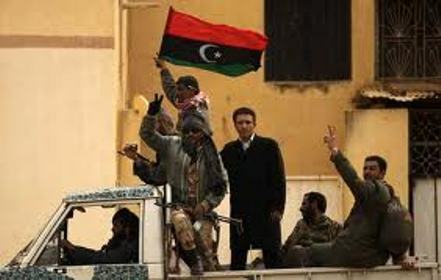 Rebels have advanced on two fronts against Gaddafi forces in recent days, but government troops have fought back and Gaddafi has also sought to encourage his forces. In Tripoli and 800 km (500 miles) to the south in the desert town of Sabha, tens of thousands — swelled by representatives of the tribes of the region — gathered for Friday prayers in what appeared to be an attempt to show that Gaddafi enjoys widespread support in the areas he still controls despite the rebel gains of recent weeks. Gaddafi supporters rallied in Tripoli’s Green Square, underscoring his refusal to step down after four decades in power and five months of fighting. Speaking on Libyan television, Gaddafi threatened to send hundreds of Libyans to carry out revenge attacks in Europe. “Hundreds of Libyans will martyr in Europe. I told you it is eye for an eye and tooth for a tooth. But we will give them a chance to come to their senses,” he said in an audio speech. While the insurgents have advanced on two fronts, rebels in Misrata have come under heavy artillery fire from Gaddafi’s forces. A rebel sympathiser in Misrata told Reuters opposition forces had been moving closer to neighbouring Zlitan, one of a chain of government-controlled towns blocking their advance to Tripoli. As they advanced, pro-Gaddafi troops inside the city fired rounds of explosives to block their progress, the sympathiser said in an email. On the other major front, in the Western Mountains region southwest of Tripoli, NATO warplanes bombed forces loyal to Gaddafi several times on Friday, their bombs landing about 3 km (2 miles) east of the village of Al-Qawalish, according to one rebel fighter. Rebel advances over the last two weeks have allowed normal life to resume in towns no longer within shelling distance of Gaddafi’s troops. Rebels staged a military parade on Friday evening in Zintan, driving tanks through the streets of town in the Western Mountains. People fired rifles in the air including one small boy who opened fire with a Kalashnikov assault rifle while perched on his father’s shoulders.